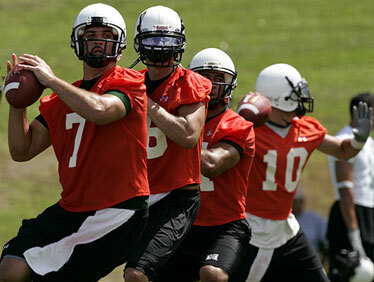 UH quarterbacks Greg Alexander, Brent Rausch, Inoke Funaki and Shane Austin went through some drills yesterday. A day after Colt Brennan's impressive professional debut, the competition to determine his successor as Hawaii's starting quarterback opened in earnest. The Warriors began fall camp yesterday with six quarterbacks decked out in orange jerseys, three heading the race for the job of leading the UH offense onto the field in the Aug. 30 opener at No. 5 Florida. While senior Tyler Graunke is held out as he addresses a personal issue, junior Inoke Funaki returns as the most experienced of the bunch, with junior college transfers Greg Alexander and Brent Rausch also in contention. Funaki was first in the rotation yesterday, followed by Alexander and Rausch. But head coach Greg McMackin maintained that the competition would remain open for the first half of camp. "I'm going to keep the same plan that we had," McMackin said. "We're looking at the JC guys, we'll make a decision in two weeks and all three of them are going to get reps. It's just cut down by one so they're going to get more reps."
With relatively inexperienced groups of passers and receivers working together, the timing on the routes still needs to be ironed out. But McMackin and quarterbacks coach Nick Rolovich were encouraged with yesterday's start. "Both of the new guys really put in a lot of hard work in the summer along with Inoke. So they're further ahead than they would be just coming out blindly," Rolovich said. "They both do some nice things." Graunke's situation puts Funaki in an unfamiliar role as the veteran after completing 10 of 15 throws for 136 yards and three touchdowns last season while backing up Brennan -- now a member of the Washington Redskins -- and Graunke. "Since I've been here I was always looking to Colt or looking to Tyler. Now I'm the most experienced here, so definitely I have more responsibility now," Funaki said. Along with responsibility, Funaki said he's bringing greater confidence into practice. "I feel a lot better than I ever have coming into fall camp," Funaki said. "I was told it looked like I was more energized. I wasn't thinking about it, but I feel like it's because coaches have shown confidence in me. "I'm the one (the offense is) looking at and how do you think they'll feel if they look at me and my knees are shaking and super scared. So it's contagious." Alexander and Rausch played in offenses similar to UH's at their respective JCs, and spent the summer working out with the Warriors, giving them a bit of a head start in making the adjustment to Division I and learning the reads in the Warriors' run-and-shoot system. "It's just the nuances of the offense," said Alexander, who threw for 71 touchdowns in two seasons at Santa Rosa College, "knowing what the receivers' splits have to be, just being exactly on the same page with everybody. It's a half-second difference between throwing it behind a guy or throwing it for a touchdown." "They have really strong arms and they have what you can't teach, height," Funaki said of the 6-foot-4 Alexander and 6-3 Rausch. "They're both really cool humble guys, very teachable, always willing to learn." The quarterbacks worked both from the shotgun and under center. Along with Funaki, Alexander and Rausch, senior Jake Santos and freshman Shane Austin also took snaps as did freshman Steele Jantz, a late addition to the camp roster. "We didn't know (if he would be in camp). It was going to depend on if they had room," said Jantz. "I was home for three weeks, but I wanted to come back early and talk to Coach and see if I could get into camp." Graunke remains on the 103-player roster distributed yesterday, but McMackin didn't have much to say on the situation keeping the senior out of camp. "I hope he takes care of what he has to take care of," he said. "But until he's here, we're moving on."